Projects - Richardton-Taylor High School Addition and Renovation — Übl Design Group, P.C. Übl Design Group is an architecture, interior design and planning studio located in Bismarck, North Dakota that works on all project types, including educational, governmental, industrial and commercial development. The original Richardton High School was constructed in the early 1960s. Over the years, the communities of Richardton and Taylor merged their school districts, enrollment has increased and the curriculum expanded, all straining the existing building. After discovering structural deficiencies, and struggling to make the building work with current technology and educational methods, the Richardton-Taylor School District voted on and passed a referendum for the construction of a new high school. Übl Design has taken an active role in guiding the school board, administration and faculty through the programming and schematic design phases of the project. 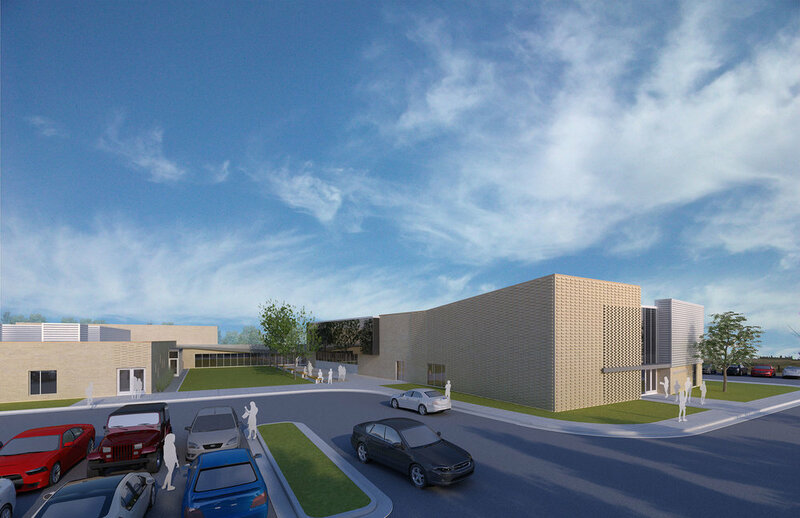 All areas of the building will be organized around a central landscaped exterior courtyard, directly south of the existing gymnasium. A main connecting corridor, also directly south of the existing gymnasium, and situated on an east-west axis, will connect the different areas of the building. Copyright © 2016-2019 Übl Design Group, P.C.